Both the playwright (Greg Keller) and the director (André Holland) of Dutch Masters are best known as actors (Keller trained as both actor and playwright, and his stage credits include the Broadway revival of Wit and, just last month, The Amateurs at the Vineyard; Holland, his grad school classmate making a directing debut here, is best known for a role in the film Moonlight and also appeared in August Wilson’s Jitney on Broadway). So it’s no surprise that this two-hander, tightly structured by Keller and beautifully directed by Holland, is an actor’s dream: two characters whose motivations and reactions at first seem opaque, and then reckless, but who are nonetheless drawn to each other. The source of their emotional bond gradually unfolds to become the heart of the play. The first half of the play unfolds almost like a mystery story; both the guys seem to have some submerged motivation to remain in each other’s company, but every time you think you have a handle on it, another piece of data emerges and shifts the frame. Eric seems to have uncanny insight into the particulars of Steve’s life: Is he a stalker? A con man? Really intuitive? Steve’s story keeps changing–he’s headed to an art class, he’s meeting his girlfriend–but he turns down opportunity after opportunity to part company with Eric. Is he running a con of his own? Does he want to buy pot from Eric? Is there some sort of sexual seduction, which neither wants to express plainly, going on? Once the answers to these questions become first creepy, then dazzlingly clear, the whole thing snaps into place. Everything you’ve seen before make perfect sense, and the whole scope of the play becomes both larger and more intimate. 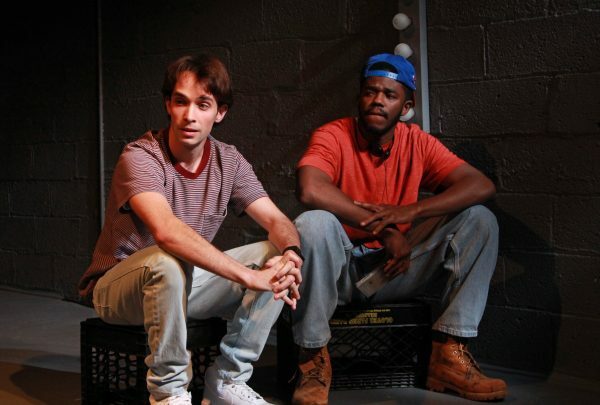 Ian Duff, making his NY stage debut as Eric, is a remarkable young actor to watch. He gives Eric a cutting, almost hungry intelligence that’s equal parts rangy intellectual curiosity and insight into social dynamics. Eric is constantly three mental chess moves ahead of the more naive Steve, playing on both Steve’s transparent desire to seem cool and his unexamined prejudices: his racism and his desire not to seem racist. At the same time, there’s something unsettled and anxious in Eric’s physicality. Duff is long-limbed and lean, and he gives Eric a sense of coiled restraint that resides in every movement; you feel like every shift of his weight and twitch of his arms is going into building the character. Jake Horowitz has the quieter part: Eric drives the action throughout; Steve reacts. But he captures Steve’s mix of fear of and attraction–not romantic, but social attraction–to Eric, or at least to the life he imagines Eric represents, and also Steve’s mixture of innocence and entitlement. Steve constantly misreads Eric’s emotional shifts as aggression or dangerous anger, instead of what we slowly realize is crippling grief. The ultimate heartbreak of the play lies in Eric’s unerring skill at reading Steve, born from both specific (he does, as it turns out, know a lot about Steve) and general (as a young black man, it’s a survival skill) knowledge, and Steve’s utter inability to recognize Eric (as either someone he actually should know or as someone who needs emotional support and help). Dutch Masters runs to April 21, 2018. More production info can be found here.